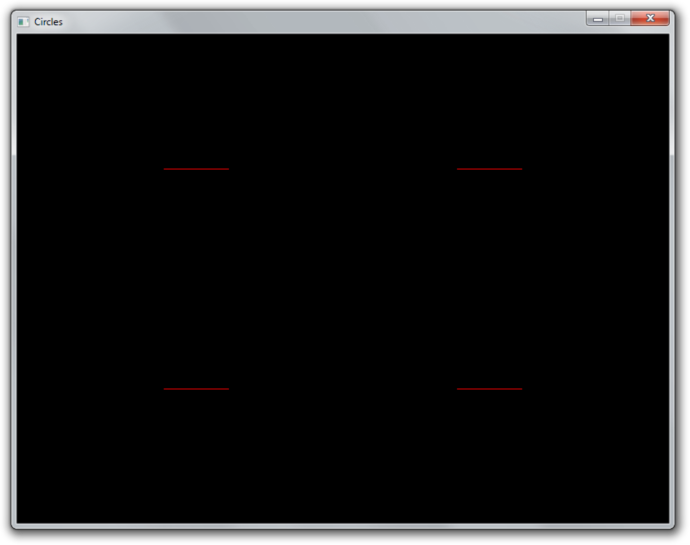 So far we've used vertex and fragment shaders to manipulate our input vertices into pixels on the screen. Since OpenGL 3.2 there is a third optional type of shader that sits between the vertex and fragment shaders, known as the geometry shader. This shader has the unique ability to create new geometry on the fly using the output of the vertex shader as input. Note that everything geometry shaders can do can be accomplished in other ways, but their ability to generate geometry from a small amount of input data allows you to reduce CPU -> GPU bandwidth usage. Let's start by writing some simple code that just draws 4 red points to the screen. We'll start by declaring two very simple vertex and fragment shaders at the top of the file. The vertex shader simply forwards the position attribute of each point and the fragment shader always outputs red. Nothing special there. We have 4 points here, each with x and y device coordinates. Remember that device coordinates range from -1 to 1 from left to right and bottom to top of the screen, so each corner will have a point. If you are having problems, have a look at the reference source code. Whereas a vertex shader processes vertices and a fragment shader processes fragments, a geometry shader processes entire primitives. The first line describes what kind of primitives our shader should process. Since we're drawing GL_POINTS, the points type is appropriate. The next line describes the output of the shader. What's interesting about geometry shaders is that they can output an entirely different type of geometry and the number of generated primitives can even vary! The second line specifies the output type and the maximum amount of vertices it can pass on. This is the maximum amount for the shader invocation, not for a single primitive (line_strip in this case). These types seem somewhat restricted, but if you think about it, these types are sufficient to cover all possible types of primitives. For example, a triangle_strip with only 3 vertices is equivalent to a regular triangle. Notice that vertex attributes like pos and color are not included, we'll look into accessing those later. The geometry shader program can call two special functions to generate primitives, EmitVertex and EndPrimitive. Each time the program calls EmitVertex, a vertex is added to the current primitive. When all vertices have been added, the program calls EndPrimitive to generate the primitive. Before calling EmitVertex, the attributes of the vertex should be assigned to variables like gl_Position, just like in the vertex shader. We'll look at setting attributes like color for the fragment shader later. Now that you know the meaning of every line, can you explain what this geometric shader does? It creates a single horizontal line for each point coordinate passed to it. There's not much to explain, geometry shaders are created and activated in exactly the same way as other types of shaders. Let's add a geometry shader to our 4 point sample that doesn't do anything yet. This geometry shader should be fairly straightforward. For each input point, it generates one equivalent output point. This is the minimum amount of code necessary to still display the points on the screen. When you run the program now, it should still display the points as before. You can verify that the geometry shader is now doing its work by removing the code from its main function. You'll see that no points are being drawn anymore, because none are being generated! Even though we've made no changes to our draw call, the GPU is suddenly drawing tiny lines instead of points! Try experimenting a bit to get a feel for it. For example, try outputting rectangles by using triangle_strip. Let's add some variation to the lines that are being drawn by allowing each of them to have a unique color. By adding a color input variable to the vertex shader, we can specify a color per vertex and thus per generated line. Because the vertex shader is now not followed by a fragment shader, but a geometry shader, we have to handle the vColor variable as input there. You can see that it is very similar to how inputs are handled in the fragment shader. The only difference is that inputs must be arrays now, because the geometry shader can receive primitives with multiple vertices as input, each with its own attribute values. Because the color needs to be passed further down to the fragment shader, we add it as output of the geometry shader. We can now assign values to it, just like we did earlier with gl_Position. So, when you specify an attribute for a vertex, it is first passed to the vertex shader as input. The vertex shader can then choose to output it to the geometry shader. And then the geometry shader can choose to further output it to the fragment shader. However, this demo is not very interesting. We could easily replicate this behaviour by creating a vertex buffer with a single line and issuing a couple of draw calls with different colors and positions set with uniform variables. The real power of geometry shader lies in the ability to generate a varying amount of primitives, so let's create a demo that properly abuses this ability. Let's say you're making a game where the world consists of circles. You could draw a single model of a circle and repeatedly draw it, but this approach is not ideal. If you're too close, these "circles" will look like ugly polygons and if you're too far away, your graphics card is wasting performance on rendering complexity you can't even see. And use the variable in the geometry shader instead of the magic number of sides 10.0. It's also necessary to set an appropriate max_vertices value for our input, otherwise the circles with more vertices will be cut off. You can now create a circles with any amount of sides you desire by simply adding more points! Without a geometry shader, we'd have to rebuild the entire vertex buffer whenever any of these circles have to change, now we can simply change the value of a vertex attribute. In a game setting, this attribute could be changed based on player distance as described above. You can find the full code here. Granted, geometry shaders may not have as many real world use cases as things like framebuffers and textures have, but they can definitely help with creating content on the GPU as shown here. If you need to repeat a single mesh many times, like a cube in a voxel game, you could create a geometry shader that generates cubes from points in a similar fashion. However, for these cases where each generated mesh is exactly the same, there are more efficient methods like instancing. Lastly, with regards to portability, the latest WebGL and OpenGL ES standards do not yet support geometry shaders, so keep that in mind if you're considering the development of a mobile or web application.